Today we where finishing off our tests. I did not have to do this, only a few had too. We all went on Mathletics and did things on division, fractions, percents, and multiplication. I worked on my division addition. I think that is the area I need to work on if I would like to get better with division. I think that if I practise more on division I will find it much easier than I did before. 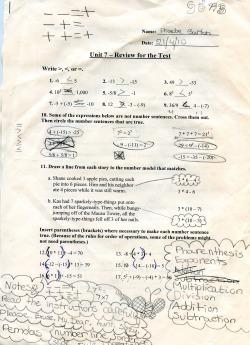 This is a page from the Unit 7 review sheet. I think that I did really well on it. I also think that I took really good notes when we where going over it before the test had started. We could use the review sheet when we where doing the test to help us. How would you spend $1,000,000. You must spend it on at least 5 different things. You need to give the amounts that you spend on each thing, as well as the percentage and fraction equivalents. Iphone 3G~ $ 299 U.S.
On 4/3/10 and on the 8/3/10 we where working on our unit 6 math test. I found the last question kind of easy because it gives you an idea of what you have to do. I really found it easy. On Thursday and Friday we had a math test on unit 5. 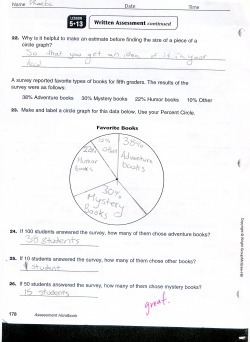 I chose problem number 23 because I find making a percent circle kind of difficult. I think that I completed the problem quite well.I really enjoyed trying to finish it. Photo of problem below.